Opioid affected births complicate nurse-mother-baby relationships and cause physical, emotional, social, and financial burdens. 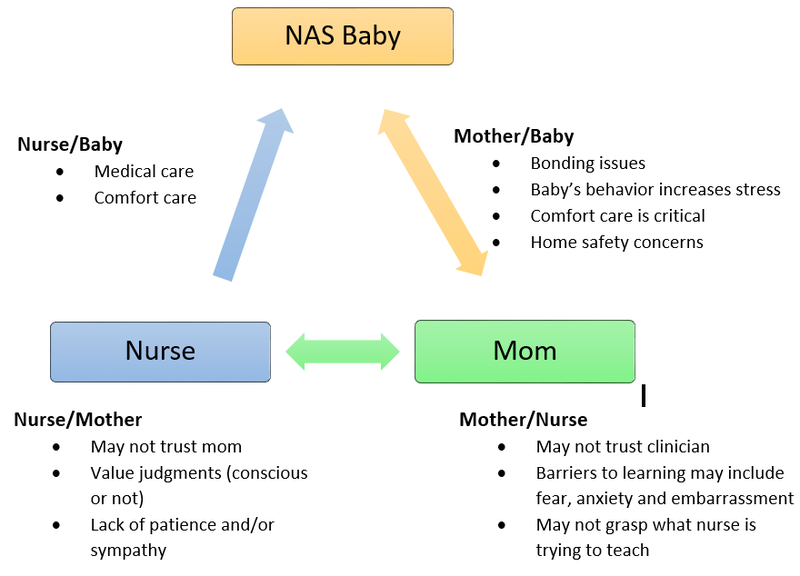 The focus of the NAS Parent Educator™ is to help educate and support NAS affected families to provide better outcomes for the baby and the mother. Typically, the educational lessons are delivered via an App that can be customized for each hospital, although other delivery options are available. Hospitals may install the app on their own devices or get dedicated tablets from MetaMD that provide additional functionality and benefits. Also, each hospital receives a code to share with parents so they may access lessons from home. Educational topics include the signs and symptoms of NAS, how it is monitored and treated, expected outcomes, how to best care for the baby, and more. A key component of the program is to encourage and engage parents to be an active part of their baby’s care. The diagram below summarizes key relationship issues, responsibilities, and dynamics that were considered while designing the program to help mothers be better providers for their babies. Helps bridge the "trust gap" that often exist between the mother and clinical staff. Assures that all information is presented consistently every time. Increases parent engagement and understanding by delivering information via smartphones and tablets -- the tools of choice for most people of child-bearing age. Provides 24/7 instant access to needed information and permits parents to educate themselves at their own pace. Never comes across to a parent as condescending or judgmental. Information is presented in everyday, layman’s terms so it is understandable by parents and caregivers from all socioeconomic and educational levels. Appeals to various learning styles by using a combination of video, audio, text, and graphics to help answer parents’ questions and ease their concerns. Users may toggle between English and Spanish versions. Saves an enormous amount of time for clinicians, social workers, and discharge coordinators, allowing them to spend more hands-on time with the babies and their families.